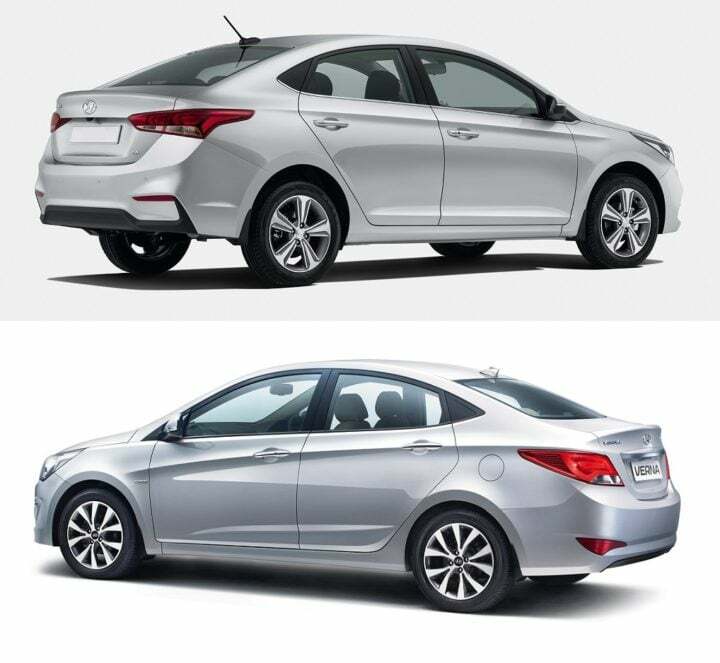 The last generation Verna was a game changer for Hyundai as it helped the Korean manufacturer to the top spot in that particular segment. With time, however, the car was seen fast losing out to the likes of Honda City and Maruti Ciaz. All this could now change with the launch of the new 2017 Hyundai Verna sedan in India. The new gen Verna not only looks fresher but is an all new car, inside and out. It has got more features, more powerful engines and a lot more going for it. 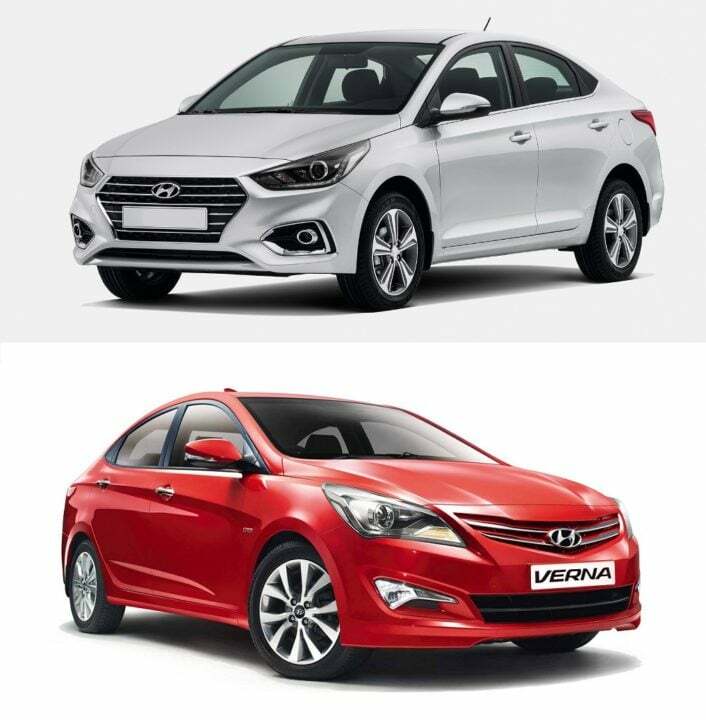 We have compared the new model Verna with the earlier version to give you an idea about the advances the latest gen has made. Read our New 2017 Hyundai Verna vs old model comparison to find out what has changed. The new 2017 Hyundai Verna builds on the current model while incorporating design touches that are in line with Hyundai’s Fluidic Sculpture 2.0. 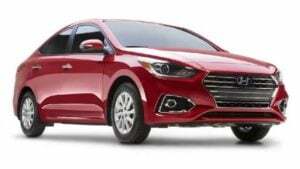 The production spec model features a new hexagonal chrome grille with Hyundai’s new signature cascading design, projector headlamps with LED DRLs and a rear end reminiscent of the new Elantra sedan. The bonnet seems flatter now and the sedan looks much wider than the outgoing model. The version coming to India differs from the one sold in China in terms of design. The new look Hyundai Verna 2017 model gets split tail lamps that look much sleeker than before. These new tail lights could get the LED treatment as well. Other additions to the exteriors include new alloys wheels, new rear view mirrors. Overall, the new 2017 model looks more mature and has a more pronounced three box profile. The interior of the new Verna features simpler and more elegant lines in comparison to the current model. 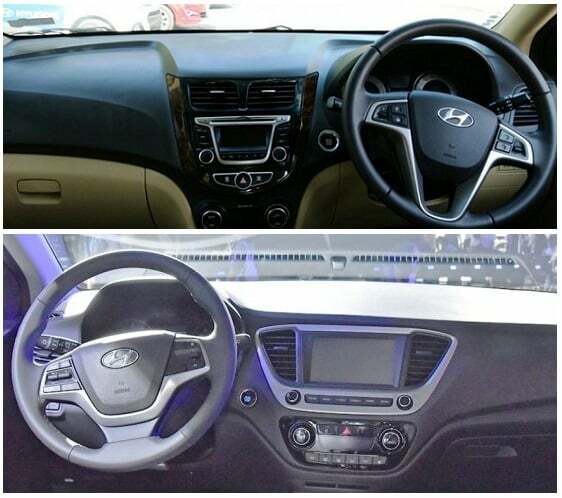 The steering wheel design is similar to the Elite i20’s and the centre console takes inspiration from newer Hyundai models. The new 2017 Hyundai Verna gets a centrally mounted touchscreen infotainment system and black interiors with silver highlights. We Expect additional features such as navigation, reverse parking camera, sunroof etc. to find their way into the cabin of the upcoming Hyundai Verna. The current model is often criticised for its cramped cabin and claustrophobic rear seat. The new 2017 Hyundai Verna should be more spacious than the current car. The current set of 1.6-litre diesel engines have been carried forward to the new 2017 model Verna. The petrol engine makes 121BHP power and 158Nm torque. The 1.6-litre turbo diesel engine makes 126BHP power and 260Nm torque. Both engines come mated to either a 6-speed manual or a 6-speed automatic gearbox. In this sense, the old model offered more engine and powertrain options. 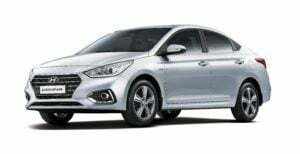 The new Verna has, what Hyundai calls, a Super Body Structure. It is made out of advanced high strength steel (AHSS) to ensure it is lighter, more rigid, safer and quieter than before. Among the new bits in the car’s structure are engine and transmission mount design, use of a tunnel insulation and application of foam filler in cavity. These help reduce the car’s NVH levels to barely-perceptible levels (as per claims). Hot stamping application of steel has ensured the car’s structure is more rigid and its crash worthiness sees a boost too. The old 1.6-litre engines, which have been even carried over to the new Verna, have almost the same mileage figures as the earlier model. In case you are wondering why the new mileage figures are slightly lower than the old model, it is because the old model also had 1.4-litre petrol and diesel engines to offer, which offered slightly higher mileage figures. 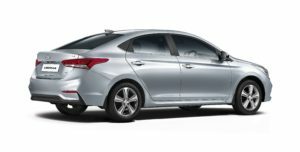 The new 2017 model Hyundai Verna is bigger than the earlier car in terms of overall dimensions. An increase in wheelbase will translate to an increase in legroom. It is also wider than the outgoing model, which means new Verna’s rear will be more spacious. Obviously, the new 2017 Hyundai Verna looks a lot more promising than the current model. The new model addresses the issues of the earlier Verna while retaining all the desirable traits that make this sedan a compelling buy. The new 2017 model could very easily challenge for the top spot once again. Design – The new model looks grown up thanks to a more mature design, increased dimensions and cleaner lines. The interior looks better and should witness an improvement in quality. Features – The Hyundai Verna has always been a feature rich offering. The new model gets equipment such as a new touchscreen infotainment system, ventilated seats, sunroof, etc. Specifications – The new car gets re-tuned versiolns of the 1.6-litre Petrol and Diesel engines of the earlier model. For the new generation Verna, both these engines offer 6-speed Manual and 6-speed Automatic transmission choices. Price – Prices of the Hyundai Verna witness a slight increase across the range. However, pricing continues to remain competitive. Stay tuned to Car Blog India for more posts like the New 2017 Hyundai Verna vs old model comparison we have here. 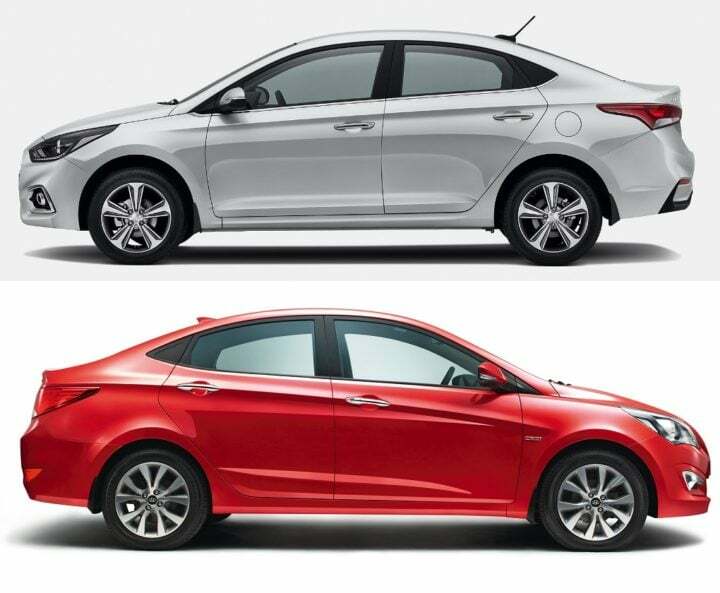 Also, what do you say about our New 2017 Hyundai Verna vs old model comparison? Do share your views by commenting below.